Not all of these are focused on birth, some are general medical journals that occasionally publish childbirth related research. I’ve tried to cover the biggest ones, not every single one. “The Gray Journal,” provides comprehensive coverage of topics in ob/gyn and women’s health including maternal-fetal medicine, reproductive endocrinology/infertility and gynaecologic oncology. The Journal publishes authoritative and current information covering the entire spectrum of the field from clinical practice to diagnostic procedure and leading-edge research. The American Journal of Public Health (AJPH) is dedicated to original work in research, research methods, and program evaluation in the field of public health. This prestigious journal also regularly publishes authoritative editorials and commentaries and serves as a forum for the analysis of health policy. The stated mission of the Journal is “to advance public health research, policy, practice, and education.” This journal has published quite a few articles on the safety of home birth. A multidisciplinary, refereed journal devoted to issues and practices in the care of childbearing women, infants, and families. It is written by and for professionals in maternal and neonatal health, nurses, midwives, physicians, public health workers, doulas, psychologists, social scientists, childbirth educators, lactation counselors, epidemiologists, and other health caregivers and policymakers in perinatal care. We publish original scientific studies, review and educational articles, and papers commenting on the clinical, scientific, social, political, and economic factors affecting health. Quarterly journal which includes current obstetrical and maternity care information teaching ideas and techniques for childbirth educators, postnatal educators, and doulas columns related to specialty issues in family-centered maternity care issues related to ICEA certification. Journal of Advanced Nursing (JAN) is a world-leading international peer reviewed Journal. JAN contributes to the global advancement of nursing and midwifery knowledge, practice, education, management and policy by disseminating high quality research and scholarship of contemporary relevance. An international peer-reviewed general medical journal published 48 times per year. JAMA is the most widely circulated medical journal in the world. For over 35 years the Journal of Obstetric, Gynecologic, & Neonatal Nursing (JOGNN) has been a premier resource for health care professionals committed to clinical scholarship that advances the health care of women and newborns. With a focus on nursing practice, JOGNN addresses the latest research, practice issues, policies, opinions, and trends in the care of women, childbearing families, and newborns. The peer-reviewed journal promotes holism: a state of harmony among body, mind, emotions, and spirit and nursing’s function within that ever-changing environment. This objective forum allows caring and innovative nurses in clinical practice, research, individual wellness practice, and academia to exchange critical information, share clinical and personal experiences, and communicate research pertaining to nursing practice, health care, wellness, healing, and human potential. The official journal of the International Lactation Consultant Association (ILCA). The International Lactation Consultant Association promotes the professional development, advancement, and recognition of lactation consultants worldwide for the benefit of breastfeeding women, infants and children. Maternal & Child Nutrition addresses fundamental aspects of nutrition as well as new initiatives, latest research and innovation in all aspects of practice and policy that impinge on nutrition and its outcomes in women and their children, both in early and later life. Its scope includes pre-conceptual, antenatal and postnatal maternal nutrition, women’s nutrition throughout their reproductive years, and fetal, neonatal, infant, child and adolescent nutrition and their effects throughout life. JMWH publishes peer-reviewed, clinically oriented, original articles pertinent to women’s health in a variety of practice settings. The journal’s focus is on current research and new knowledge in maternal-child health, well-woman gynecology, primary health care, family planning, and health care policy. JMWH provides a forum for interdisciplinary exchange across a broad range of women’s health issues. The Journal of Perinatal Education is the leading peer-reviewed journal specifically for childbirth educators. Through evidence-based articles, the journal keeps educators informed about research and its implications for practice. Journal features provide practical resources and advice educators can use to enhance the quality and effectiveness of their teaching to prepare expectant parents for birth. The Journal of Perinatal and Neonatal Nursing (JPNN) strives to advance the practice of evidence-based perinatal and neonatal nursing through peer-reviewed articles in a topic-oriented format. Each issue features scholarly manuscripts, continuing education options, and columns on expert opinions, legal and risk management, and education resources. The perinatal focus of JPNN centers around labor and delivery and intrapartum services specifically and overall perinatal services broadly. The neonatal focus emphasizes neonatal intensive care and includes the spectrum of neonatal and infant care outcomes. The Lancet is an independent and authoritative voice in global medicine. We seek to publish high-quality clinical trials that will alter medical practice; our commitment to international health ensures that research and analysis from all regions of the world is widely covered. MCN’s mission is to provide the most timely, relevant information to nurses practicing in perinatal, neonatal, midwifery, and pediatric specialties. MCN is a peer-reviewed journal that meets its mission by publishing clinically relevant practice and research manuscripts aimed at assisting nurses toward evidence-based practice. MCN focuses on today’s major issues and high priority problems in maternal/child nursing, women’s health, and family nursing with extensive coverage of advanced practice healthcare issues relating to infants and young children. Midwifery enhances the quality of care for childbearing women and their families by encouraging midwives to explore and develop their knowledge, skills and attitudes. This journal provides an International and interdisciplinary forum for the discussion of advances, controversies and current research and actively promotes continuing education through publication of reviews and updates on all aspects of midwifery. 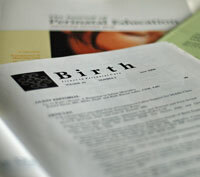 Experience the feeling of opening the pages of Midwifery Today. It’s like sinking into a nice warm bath, or sharing birth stories with a best friend. You’re at home here, you know the issues, feel the excitement, understand the pain. Learn about the latest scientific studies that will support your intuition, and what books will help the women you serve. Enjoy a warm hug, a good laugh, support and encouragement. A weekly general medical journal that publishes new medical research findings, review articles, and editorial opinion on a wide variety of topics of importance to biomedical science and clinical practice. Obstetrics & Gynecology is the Official Publication of the American College of Obstetricians and Gynecologists (ACOG). Popularly known as “The Green Journal,” Obstetrics & Gynecology publishes original articles and research studies on: scientific advances, new medical and surgical techniques, obstetric management, and clinical evaluation of drugs and instruments. Women and Birth publishes on all matters that affect women and birth, from pre-conceptual counselling, through pregnancy, birth, and early parenting. We are interested in articles on issues relevant to the full scope of midwifery practice as defined by the International Confederation of Midwives (2005). We are also concerned with the longer term health effects of childbearing for women and babies. Our woman-centred focus is inclusive of the woman’s baby, unborn , newborn and infant, both well and ill, and covers both normal and complex pregnancies.